I was six weeks old when my parents took me on the road, parking my baby carriage behind the counter of the carnival games they operated all over New England. As a carny kid I had the run of the midway. My favorite ride was the Tilt-A-Whirl, which I rode in marathon sessions with the show owner's daughter and my doll. My first job was picking up darts and replacing busted balloons in Mom's dart game. In the wintertime, we lived in my grandmother's house in New Haven, Connecticut,where I attended school. When the carnival season began in April, I became the first correspondence student in the history of St. Anthony's School. I spent the first 17 years of my life on the midway, often yearning to travel far beyond the carnival circuit. A scholarship took me to Sarah Lawrence College, then to a study-abroad program in Japan, where I spent three years in Kyoto. After graduating from college with a dual major in Creative Writing and Asian Studies, I landed my dream job in New York City. I worked for the Tokyo publisher Shueisha, scouting projects for the book division and penning "New York Message" columns for the Japanese edition of Cosmopolitan. Now a New York City-based writer, journalist, and social media manager, I live in an apartment that's not much bigger than our old travel trailer. But just as cozy. 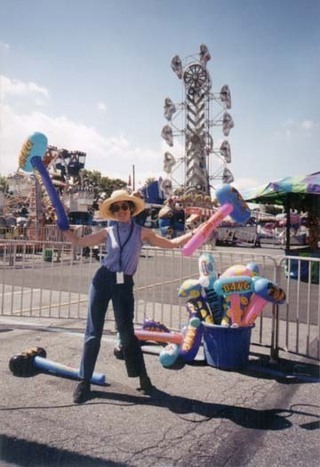 In 2001, homesick for the midway I'd left behind, I went on the road with S & S Amusements, touring the Pennsylvania fairs. Since then, I've worked as a game agent with Wade Shows at New York City's Big A Fair, the Delaware State Fair, the Michigan State Fair and the Central Florida Fair, as well as in Brooklyn's Coney Island, where I work today.